A tropical teardrop island at the foot of India. A country of contrasts with sweeping golden beaches fringed with swaying palms, rolling misty hills and dazzling waterfalls, fascinating ancient cities and Buddhist temples. Combine lazy days on the beach with cultural tours to experience the impressive cultural sights, Elephant camps or the high ranges that abound in tea plantations. Browse through the locations and suggested itineraries and we would be delighted to tailormake a holiday to suit your requirements. Colombo is the commercial capital of Sri Lanka and has a fascination of its own. Nearly every visitor to Sri Lanka begins or ends his stay in Colombo. More than anywhere else in the country it`s a city where the old and new co-exist. There are high-rise complexes and colonial mansions, supermarkets and street bazaars, flashy western fashions and traditional sarongs, speedy sports cars and one-man rickshaws. Most of the remnants found in Colombo today are the legacy of the British, Dutch and Portuguese. Horseracing was a regular activity on the seaside Galle Face Green. Today, most of the hotels are gathered around this same Green, now minus the horses. Visit the gemming area, panning of gems, watching men at work with their age-old customs and rituals. Experience the thrill of unearthing a priceless treasure. Visit a gem cutting and polishing centre and the gem museum. View an exhibition of Sri Lankan Gems. Famous for a 1st century B.C. Cave Temple complex, which is an archaeological treasure. The rock temple is a series of caves (05), which has a painted area of more than 20,000 sq. ft of stunning Buddhist murals. A huge 47 ft. rock cut of a sleeping Buddha dominates the main cave. Sigiriya is a fascinating fortress, which was a stronghold of a fifth century king who murdered his father. The red stone rises 600 feet from the green scrub jungle it is famous for its frescoes painted within a sheltered rock. Only 19 out of the 500 painted in the 5th century remain. 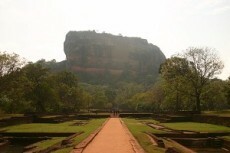 The Lion stairway, the mirror wall and the water gardens are amongst Sigiriya`s other highlights. Polonnaruwa - Sri Lanka`s medieval capital [11th-12th century A.D] is a well-preserved metropolis of buildings and shrines. The majestic King`s council chamber, the rock cut Lotus Bath, the statue of one of Polonnaruwa`s great king`s, Parakramabahu and the rock cut sculptures of the Gal Vihare (temple) are a few of this capital`s memorable sights. Anuradhapura has been the greatest city of all. 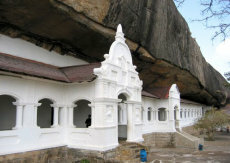 It remained the capital of Sri Lanka for about 1400 years. Its ruin`s today displays infinite details of rare beauty, delicately set in the world`s mightiest masses of monumental masonry second only to the Pyramids of Egypt. 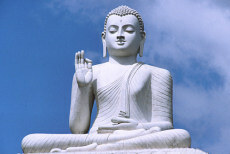 The best time to visit Anuradhapura is during `Poson Poya` June - the most sacred place is the `Sri Maha Bodhiya`. Worship at the bo tree has continued unbroken for 23 centuries. The story of Mihintale is a story etched deep in the national consciousness. It was at Mihintale that, King Devanampiyatissa while on a deer hunt with his attendants encountered the grandest event in the history of this land - the advent of Buddhism. Kandy - the royal city, nestling amidst the mid-country hills was the last seat of the Sinhalese King, Sri Wickremarajasinghe. Every visit to Sri Lanka should include its second largest city, Kandy; the Sinhalese cultural and spiritual centre - made even more appealing by its comfortable climate. 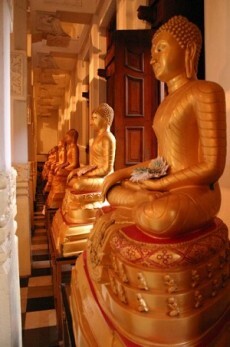 It is the home of the sacred temple in which is enshrined the Tooth Relic of Lord Buddha. Pinnawela is situated 52 km away from Colombo. It is an orphanage for baby elephants created by the Department of National Zoological Gardens. The orphanage was established to feed, nurse and house young elephants found abandoned by their mothers. Other inmates are those displaced from their natural environs by development projects or those found wounded. It has been recorded that a few baby elephants have been bred here in captivity. The main tourist attraction in Matale is the handicrafts and Spice Gardens where one can view various spices that have been grown. A guided tour explains the herbal and medicinal value of these spices. Matale is also known to have some of the best craftsmen in the country. Having learnt the work from their ancestors, these talented craftsmen strive to create works of art making use of the traditional methods to suit the modern day living styles. The British rulers modelled Nuwara Eliya on an English Village in the early 19th century, with homes and buildings in styles from Georgian to Queen Anne. It is 1890 meters (6199 ft) above sea level. Cool rugged and picturesque, it is set in the heart of the tea country. Throughout the surrounding you will come across beautiful waterfalls cascading hundreds of feet down mountainsides. One of the biggest attractions in Nuwara Eliya is the 18-hole golf course, one of Asia`s finest. The major beach resort on the coast north of Colombo is Negombo, popularly known as the Fishing Village. Here is an old world atmosphere of 17th century churches that line the highway and forts. The feast of St. Anne is celebrated here in late July in a carnival atmosphere. All of these towns have very good beaches and have an array of hotels to choose from. Along the coast there are a variety of activities including water sports. Galle the seaside town is famous for its well-preserved 17th century Dutch Fort, lace making and ebony carvings. The journey to Galle is along the Palm fringed coast passing Ambalangoda, famous for its mask makers and Hikkaduwa with its incredibly beautiful coral gardens and exotic tropical fish. Seafood is a specialty all the way. Another interesting place to visit is a Turtle Hatchery. Hambantota, is the largest town on the south-eastern coast and is a well sheltered fishing port. Just outside the town are saltpans where seawater is left to evaporate, then carried by rail to salt factories. The town also boasts the best curd (a local yoghurt made out of buffalo milk) and traditionally eaten with honey.